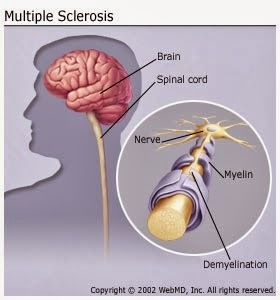 Multiple sclerosis is commonly described as a disease of the central nervous system. This condition can evolve until it affects the brain and the spinal cord. The most common type of multiple sclerosis is the relapsing remitting form. When this disease is developed, symptoms relapse, meaning that they can be experienced on a limited period of time, after which they disappear, appearing again after several months. In fact, the symptoms that multiple sclerosis causes cannot only be associated to this disease. This is why in many cases patients have no idea that they are dealing with MS, associating their symptoms to other conditions. There are some signs and symptoms of multiple sclerosis that are common in most cases. These symptoms can be felt in the first stages of development of the disease. One of the most important things worth to be known about the signs and symptoms of multiple sclerosis is that fatigue is actually felt in more than 80 percent of all MS cases. Any patient will experience fatigue, at some point or another. There are cases in which fatigue is felt by patients each day and tends to get worse as time goes by. Vision problems are common in MS patients as soon as the disease is developed. This condition can cause double vision, eye pain, but also blurred vision. Symptoms can cause the inflammation of the optic nerve; this is why certain eye problems are felt by patients. Numbness and tingling are also common in people suffering from multiple sclerosis. These symptoms are actually two of the first that make patients realize that their health might have been harmed. Numbness can be experienced in the face, legs, arms and the body. Pain is highly common in MS patients. In fact, almost all patients experience pain due to multiple sclerosis. Pain is related to the type and degree of damage produced to the nerves. In some cases patients can experience burning sensation, as well as severe discomfort. Weakness in one limb is commonly reported by people suffering from MS. In some serious cases, patients can find it hard to stand on their feet. Control balance can be worse or milder depending on whether the cerebellum has been affected or not. Other signs and symptoms of multiple sclerosis include bladder dysfunction, constipation, depression, sexual dysfunction and speech disorders.